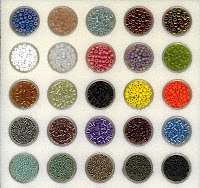 My love affair with seed beads began over a dozen years ago with the discovery of Miyuki brand Japanese seed beads. I can still remember receiving my first half-kilo cellophane bags of loose 11/0 and 6/0 beads. Their beautiful colors and finishes were as alluring to me as faceted jewels. 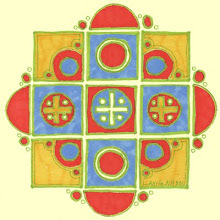 Today Anita's Beads offers Miyuki beads in size 15/0, 11/0, 11/Delica, 8/0, 8/Delica, 6/0, 4mm Cubes and Size 3 Bugles, with a few Hex-cut beads thrown in for variety! Miyuki has earned the reputation for high quality, uniform size and incredible color selection. 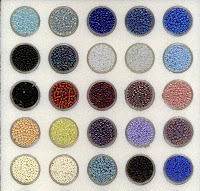 Japanese seed beads manufactured by Toho are available in some unusual colors which have caught my attention more recently. 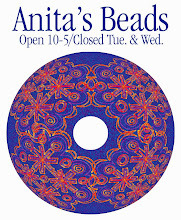 Selected size 11 Delica-style beads called "Treasures" have been now been added to Anita's seed bead wall, in addition to some favorite hues in the 11/0, 8/0, and 6/0 sizes. 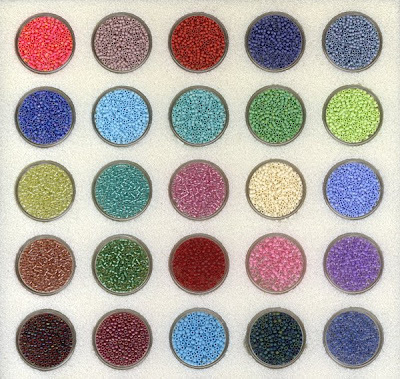 In my next post I will talk about what all those numbers mean in terms of actual size, and show you the seed bead wall at Anita's Beads, along with details on the recent Toho additions.